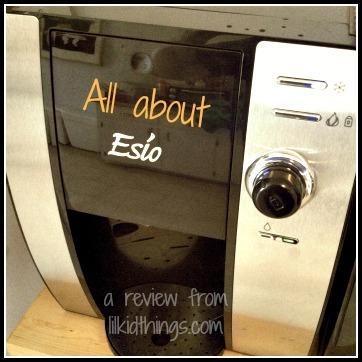 I recently had the chance to try out the new Esio hot/cold drink maker. Have you heard of it yet? After a rocky beginning with a dud machine, I am really pleased with the results! Check out my video review and let me know your thoughts and questions! The Esio Beverage maker is available at Walmart and on EsioBev.com for $199. Refills are $5.98 (our favorites are V8Splash and the Crystal Light Peach Iced tea). What I love about the Esio is that I can enjoy calorie free drinks whenever I want or have hot water at the push of a button. What I would like to see are more options for hot drinks like hot chocolate and tea. I didn’t care for the coffee options, but the cold drinks were super yummy! I think this would be a great machine for an office environment. What do you think? Have you tried the Esio yet? Disclosure: I was provided with the above product to facilitate this review. All thoughts are my own.